Address: 14 Gravel Walk, Canterbury, Kent CT1 2TF,United Kingdom. Find hotel near Whitefriars Artisan Marke .. Taking place on the first Saturday of every month at the Whitefriars square, the Whitefriars Artisan Market offers artists and local food producers the opportunity to sell their wares directly to the public. A must visit if you are town when the market stalls have been put up. Recommended time to visit is 09:00 am to 04:00 pm. Bus stops at Whitefriars square. Whitefriars Artisan Market Address: 14 Gravel Walk, Canterbury, Kent CT1 2TF,United Kingdom. 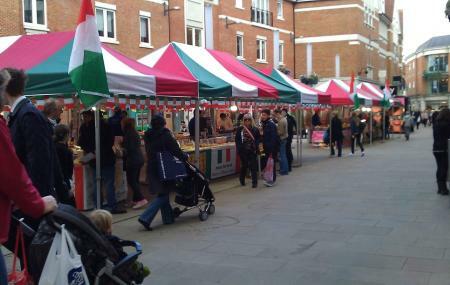 How popular is Whitefriars Artisan Market? People normally club together Canterbury Castle and The Foundry Brew Pub while planning their visit to Whitefriars Artisan Market. Outside shopping centre. I really enjoyed being able to walk around this place due to its traditional centre style rather than being couped up in an indoor shopping centre. Some wonderful buildings nearby. Obvious downside is when it rains, which it did! This is one of the nicest shopping centres in Kent. There is a nice range of different shops. The centre itself puts on events through out the year. Very well maintained. Most shops are occupied. Light airy environment. Nice to sit in summer. Away from traffic. But close to all amenities. First there is the awe inspiring Canterbury Cathedral, which is a must to visit of you've come to Canterbury. But do not overlook the shopping streets around the Cathedral. Some of the buildings are from the medieval era. All of it is extremely photogenic. The Cathedral at night is stunning. Lovely shopping area. Wide walkways with a good selection of shops on either side. Lovely atmosphere....especially at Christmas with Christmas stalls and lights and festive food!